What’s cooking in Pauline-Cuisine ? I am quite fed up by the weather at the moment, I didn’t use a lot my balcony and I can’t do my favorite skewers on the barbecue. With my winter mood, sometimes it is hard to wake up on the weekend. When I wake up quite late, that is difficult to eat a breakfast and a lunch. So usually, I cook a brunch. Last weekend, I was not in mood to eat a lot of pancakes, brioche or bread…. So I decided to cook something new, still sweet but not as usual. I bought pork chops on Friday and I decided to use them. Surprised? A few weeks ago, I have seen a recipe where you need to mix the pork chops and orange juice. I was not really convinced by the idea but I decided to give a try as I feel it because I don’t have the recipe. First, I mixed sugar and orange juice and let them cook in a pan in order to create a kind of caramel, then I put the mixture on the pork chops and cook the pork chops. In order to accompanying the meat, I cooked peaches that caramelized thanks to their own juice. The sweet and sour mix was amazing and this recipe was a success. 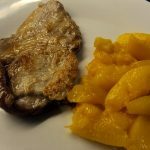 Don’t hesitate to give a try to this new recipe: pork chops with caramelized peaches. I wish you an excellent week.